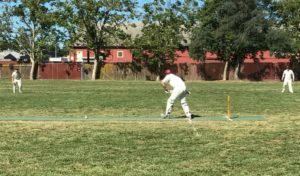 The Napa Valley Cricket Club (NVCC) inaugurated a new intra-club match recently as they played a City v County Challenge Match at the Napa Valley Expo in downtown Napa. 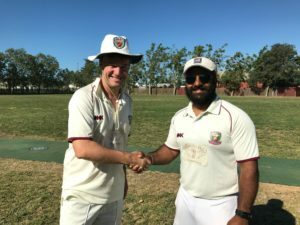 In near record temperatures with the mercury topping 105f in the shade, the club started playing at 9:00am and shortened the match from their regular format 35 overs to 25. This was the first time that NVCC had played a match at the Napa Valley Expo since their move south from Calistoga so an intra-club match allowed them to test the pitch, field, and facilities at the Expo which all passed the test with flying colors. The toss was won by County captain Bernie Peacock who, not surprisingly given the forecast heat, put the City team in to bat first. He was rewarded with early wickets as Abhijit “Doc” Adhye (two runs off six balls), Tim Kay (zero off one), and Phil Bourke (two off ten) went cheaply. Bourke did provide a foil to City batsman John Leake and allowed him to get established with the pair putting on 19 runs for Bourke’s wicket. Leake ended up with an impressive knock of 55 runs off 46 balls, a total that included (six fours and three sixes). After Bourke departed Leake formed partnerships with Rob Bolch (28 runs) and Pete Sander (48 runs). Sander himself continued his fine recent batting form scoring 15 off 10 balls watched by his young children on Father’s Day. A captain’s innings from Chandanpreet Singh of 52 runs off 31 balls helped propel the City team to a substantial total of 190 runs from their 25 overs. Singh’s knock included seven fours and two sixes and highlighted the progress he’s made with the bat since joining the NVCC in early 2016. Singh batted out the innings with NVCC secretary Scott Curwood who himself chipped in with 19 off 25 and included one four. For the County team the pick of the bowlers were the Maqsood brothers – Moe (2 wickets for 19 runs off 4 overs) and Adersh (2 for 33 off 5) – who took two wickets each and Karan Grewal who took 1 for 30 off 5. The key wicket of Leake fell to a half-tracker bowled by Leigh Ritchie and taken well by Grewal at long on. Captain Peacock bowled economically but failed to take a wicket, as he so often does, and returned numbers of 4 for 16 and had one maiden over – no runs scored or conceded. 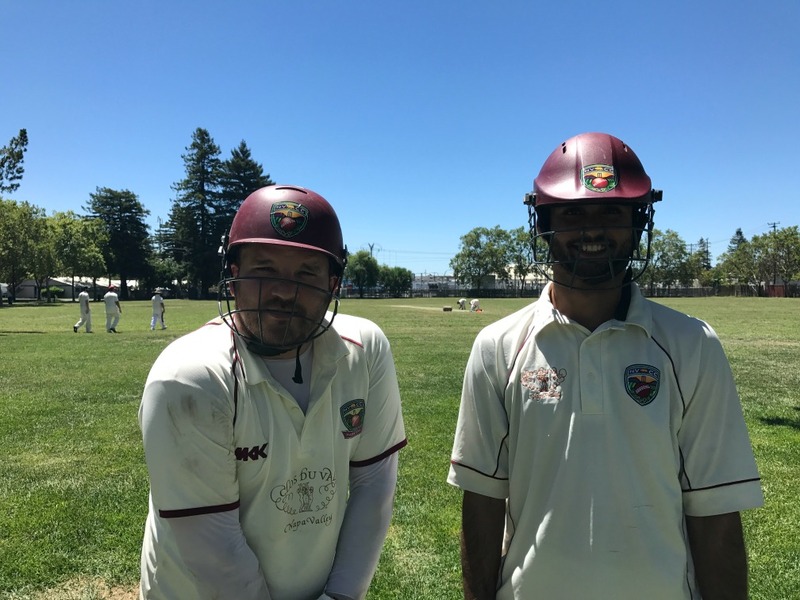 A quick turnaround saw Moe Maqsood and American-born NVCC treasurer Jared Thatcher open the batting for the County team. The City team found their line and length as opening bowlers Tim Irwin and Bolch each took wickets in the first four overs. The County side were struggling to get going and it got worse as Tim Kay was tossed the ball by Chan Singh as the first change bowler. Kay unleashed a barrage of medium paced seam bowling that caused havoc amongst the County batsmen’s ranks. Three wickets for Kay (American born Pete Cameron 12 off 33, Grewal 5 off 8, and Ritchie 1 off 7) ate into the chase by the County team. Grewal’s wicket, in particular, was a stunner with Irwin taking a scintillating one-handed catch over his head, steps from the long-on boundary. The fightback for the County team was led by new NVCC member Harjit Singh who had the best innings of the day – 63 off 44 – where he targeted the short deep-fine-leg boundary to great effect notching up eight fours and two sixes in a knock that almost won the match for the County team. Adersh Maqsood supported Harjit Singh well until he was undone by the tricky, and sometimes indescribable, bowling of Irishman Andrew Healy. A fine knock of 24 runs not out off 21 balls from American-born Jamie Johnson helped to add a respectability to the County chase but in the end they ran out of overs with Sander adding the prize wicket of Harjit Singh and also Pete Carson in the 24th over. NVCC City Batting – John Leake 55 runs off 46 balls (6 x 4, 2 x 6), Chandanpreet Singh 52 not out off 31 (7 x 4, 2 x 6), Scott Curwood 19 off 25 (3 x 4). NVCC County Bowling – Moe Maqsood 2 wickets for 19 runs off 4 overs, Adersh Maqsood 2 for 33 off 5, Karan Grewal 1 for 30 off 5. NVCC County Batting – Harjit Singh 63 runs off 44 balls (8 x 4, 2 x 6), Jamie Johnson 24 not out off 21 (3 x 4), Adersh Maqsood 18 off 20 (1 x 4, 1 x 6). 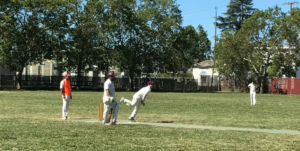 NVCC City Bowling – Tim Kay 3 wickets for 11 runs off 4 overs (incl. 1 maiden), Pete Sander 2 for 3 off 1, Tim Irwin 1 for 20 off 5.